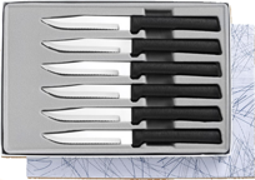 A great starter gift set with six 3 7/8 inch Serrated Steak Knives. Mini serrations cut through T-Bone Steak, Iowa Chops, Pot Roasts and Pork Loins. Nice Housewarming gift! All items are made with T420 surgical quality, high carbon, stainless steel blade is engineered to stay sharp longer. The handles features a solid stainless steel resin handle with a finger guard and the Black matte finish specially designed for the dishwasher. All Rada sets come in a beautiful velvet lined boxes and a lifetime guarantee from defects in materials and/or workmanship. Made in the USA. Box set do not come with cardboard sleeves they will need to be ordered separately or order items individually. Bring out your inner chef with the G26S Six Steak Knives gift set from Rada Cutlery, brought to you by radaknivesforyou.com. This steak knife can also be purchased individually serrated steak knife by Rada Cutlery with black SS resin handle. Don't forget to check out our Non-Serrated steak Knife by Rada Cutlery with black SS resin handle.